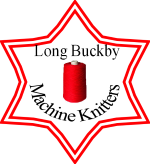 Long Buckby Machine Knitters is a club primarily for sharing ideas and expertise about machine knitting, although we also indulge occasionally in other textile crafts. We welcome anyone who wishes to share with us, and anyone who would like to visit from other clubs. We are also happy to visit other clubs, and share our expertise. Please visit or get in touch!